What is it? A creature from the deep? Captain Nemo's worst nightmare? 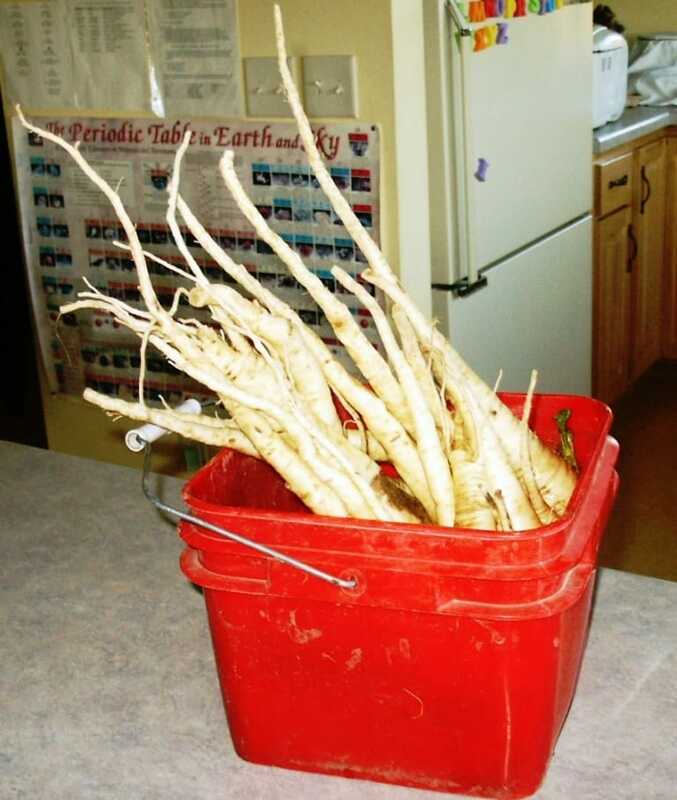 Nope – just this year's harvest of parsnips posing as a parsnip squid. What I love best about parsnips is that they are ready to harvest when very little else is available. 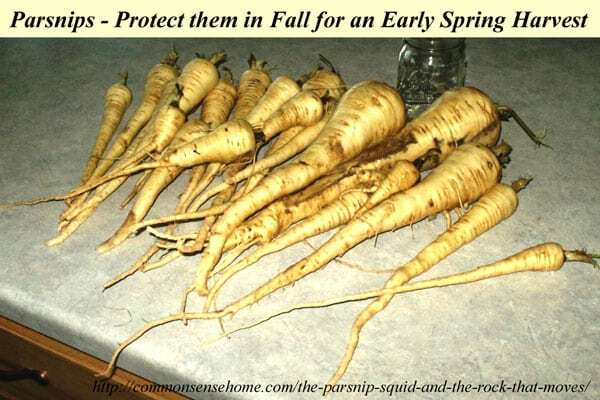 I always overwinter my parsnips (i.e., leave them in the ground over winter and harvest them in the spring). The freeze/thaw cycle converts more of their starches to sugars and makes them absolutely delicious. 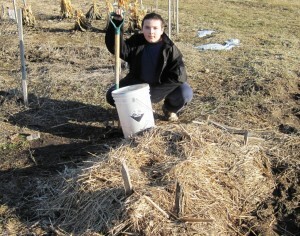 Come late March/early April, the boys and I head out to where we've buried the plants the previous fall under a thick layer of straw. My stepdad swore up and down that the ground wouldn't freeze if you covered it in this much straw, but mine surely did, so we had to wait to dig until the frost was gone. It was my intention to post this sooner, but I figured it was still worth sharing, as many of you (like me) are planting your gardens. I'm hoping this might inspire you to give parsnips a try, if you haven't already. Once the straw is pulled back, you look for the first signs of greens poking out of the ground. You want to make sure that you dig these up as soon as possible, because the goal of that root is not to feed you, but to send up a flower stalk and produce seeds. 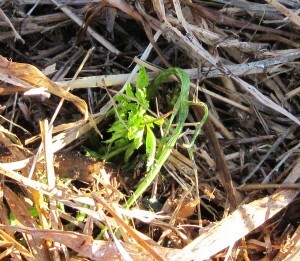 Once more leaves become visible, chances are that the sugars stored in the root are being used up and the parsnip will become tough, woody and bland. 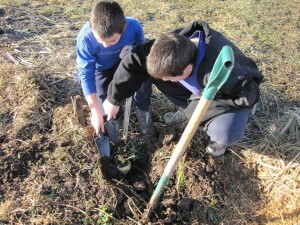 Parsnips can require some effort to get out of the ground, as they will send out very deep tap roots. This year we had several that were about as large in diameter as a mason jar (see second photo above) and about 2 1/2 feet long. The boys really had to dig to excavate these tasty treats. I usually just saute mine in some butter or coconut oil, but if you want to get fancy you can try out Andrea Chesman's recipes for Mapled Parsnips or Balsamic-glazed Parsnips in the Garden-Fresh Vegetable Cookbook. 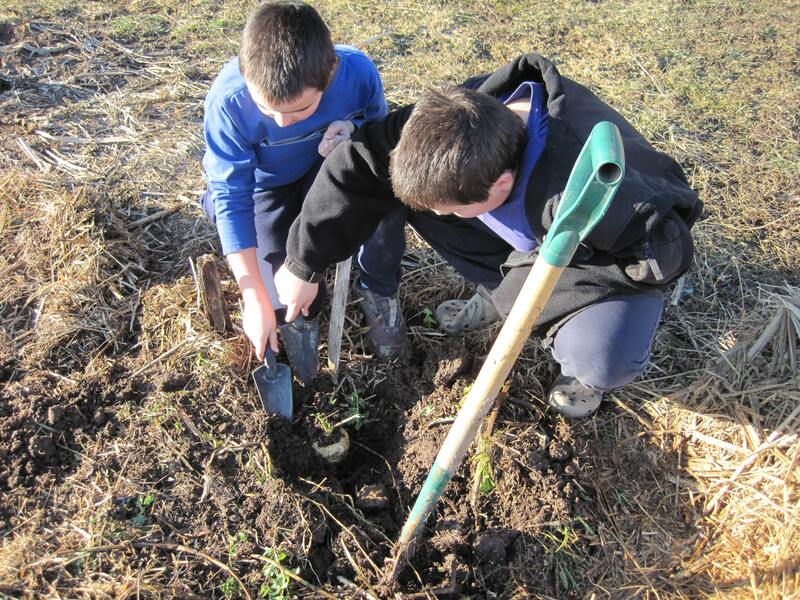 To grow your parsnips, plant the seeds about 1/2 deep in well-loosened soil (remember – deep roots). Keep soil moist until seedlings appear. 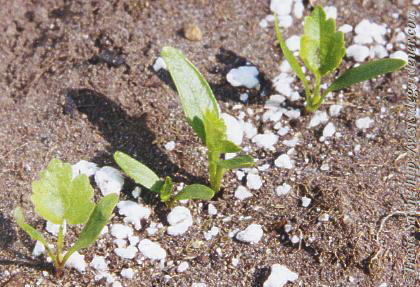 Parsnips are slow to germinate (they can take around three weeks to emerge), and the germination rates drop significantly as the seed ages. If I don't have fresh seed (even if it's only one year old), I plant it as thick as the hair on a dog's back and thin the seedlings to about one every three inches, if needed. If you don't know what a parsnip seedling looks like, take a peek at West Side Gardener for a photo. 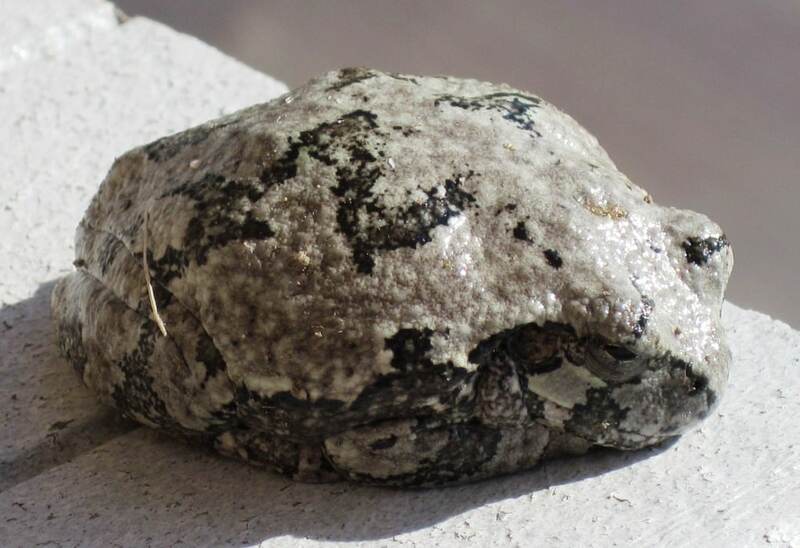 Oh, about the rock…we've had the cutest little tree frog hanging around our deck and greenhouse. He'll come at night and catch moths on the screen door, and during the day I've seen him regularly just sitting – oh so still – on the deck, where he blends in famously. Oh, how I adore parsnips! I went through a phase not to long ago where I ate them at every meal. How is it that carrots get all of the glory, when parsnips are so yummy? I have never tried parsnips. Wow!! That frog sure blends in. It does resemble a rock. What kind of tree frog is it? I thought all tree frogs were green. You should try parsnips – they are very tasty! We don't spray and allow some vegetation for cover, so we get a fair number of amphibian and reptilian visitors, including fox snakes, northern red belly snakes, and an assortment of frogs and toads. Laurie, I love parsnips. I'm looking forward to planting them this summer. I hope I have all the timing figured out. Thanks for the great tutorial! This is something I need to do mainly because they overwinter. I have the seeds but not the depth so I need to figure out where to grow these. I need something that is raised deep enough. Maybe a trough or bin, just for growing those? Or maybe boxing out an area with strawbales and filling with dirt? The bales would provide insulation over winter. 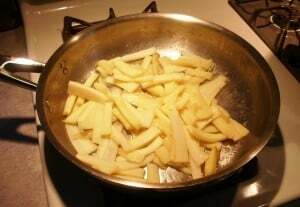 I always cook my parsnips in butter and just salt to taste (Moms way). I also read to plant 8-10 inches deep for more root and less greenery. Have you actually planted them that deep? I don’t see how they would ever germinate at that depth and I’ve never heard of such a thing, but I’m curious. In my experience, large roots are simply a result of plenty of room to grow and good growing conditions. Some of my largest roots have been around 2 feet long and were difficult to dig out because of their length, so I wouldn’t really want them any longer. 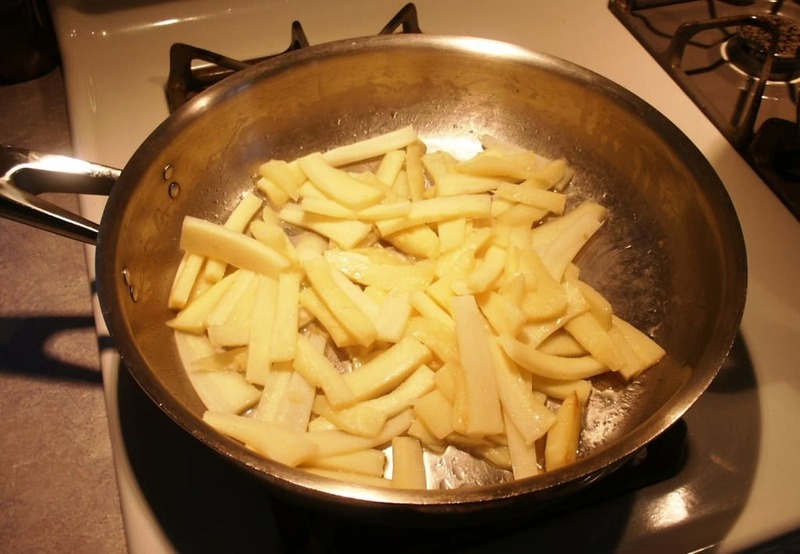 I was digging up the “wild” parsnips(another story) as I have phytophotodermatitis, and some of them were good size so my husband cleaned them up I cooked them up – yum. My question, there are a lot of little parsnips, have you ever planted them and had them continu to grow? I am trying that. I put them in some water until I am done digging for the day, and I have an old hot tub that I garden in so I am putting in some of the little ones between the 2 year old kale plants. We live outside Erie, PA.
I’ve tried transplanting both carrots and parsnips. When they are super tiny (only a few leaves) I’ve had pretty good results. Anything larger than that, and the roots tend to get gnarled and hairy and not be very good eating. I’ve never attempted to hold roots over in water, but I suspect it wouldn’t improve matters. Hi, I’m confused about when to plant parsnips. I planted mine last April and have great parsnips now, it’s October. Should I dig them up since they have been in the ground for 7 months and plant more or leave these in the ground until spring? They still have tall stalks, and I’m in the northwest so the ground doesn’t really freeze here. I have already eaten the largest, they were very tasty. You can dig them now and eat them if you choose, or try holding them until spring. My ground freezes here, so I don’t have experience holding them over in non-freezing ground. Might be worth it to try some both ways, if you have enough to experiment.